Calenda Maia (Provencal for the First of May) played traditional folk music with a modern and sometimes untraditional sensibility. Calenda Maia’s repertoire included tunes and songs ranging from Irish to bluegrass to medieval dance music. Violin, pennywhistle, guitar, acoustic bass, congas, djembe, and myriad percussion blend to form a unique and energizing ensemble. Calenda Maia played festivals, parties, and fundraisers in “concert-style” and contra dances and barn dances with a dance caller. Calenda Maia was based in Guilford, CT.
Calenda Maia at the New Haven Festival of Arts and Ideas. 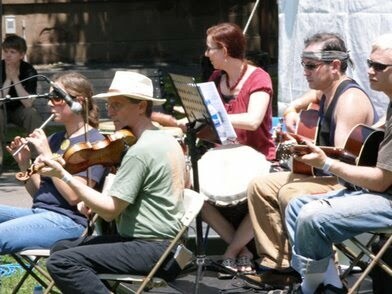 Pictured, left to right: Kate Melina (flute and whistles), Colin Healy (fiddle), Carol Pena (congas / djembe / percussion), Jeff Munsie (bass), Case Sanderlin (guitar). Calenda Maia rehearsal. 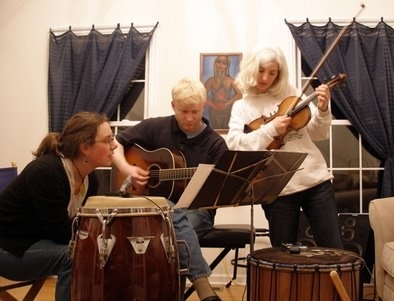 Pictured, left to right: Kate Melina (flute and whistles), Case Sanderlin (guitar), Deborah Cafiero (violin).